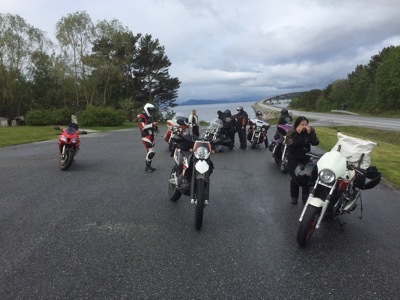 9 people, 7 bikes, 4 days, 3 nationalities – 1 brilliant ride! Actually so brilliant that we need to do it again next year. The crew from Finland: Antti, Mia, Jaana, Reijo, Ilpo and Timo, flanked by Danish Andreas. 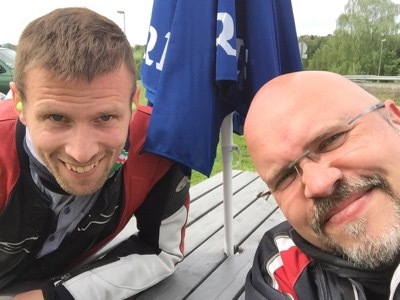 Ilpo (FIN), Andreas (DK) and myself (NO) are working for the same company in our respective countries. 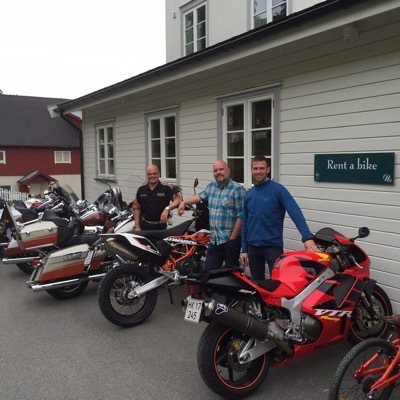 When we learned that we also loved to ride motorcycles, the plans for a joint ride in Norway took shape rather rapidly. 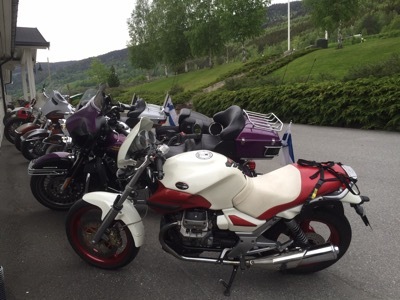 So when the day arrived for a proper Tour de Force in the tenderloin of the Southern and North Western Norway this Thursday in June, we were no less than six Finns on four bikes, two Norwegians on each of our bikes, and a Dane on his. A pretty good set-up for an extended weekend. 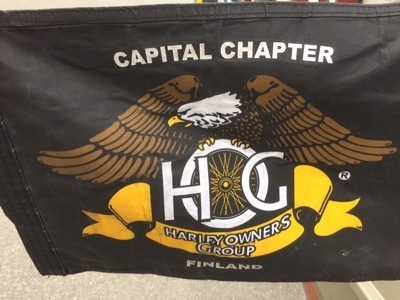 Even though the bike models were spread from my rather off road biased KTM 690 Enduro via my wife Sølvi´s Moto Guzzi Breva 750 and Andreas´ Honda SP1 to the Finns´Harley-Davidson Ultra Classic Heritage whatever, the route we chose was suitable for all. You can find the majority of the route here. Therefore we chose to meet at Nermo Hotel just north of Lillehammer. I met up with Andreas as he pulled off the ferry from Copenhagen on the Thursday morning, and we set off for Nermo. My wife had some work to do first, so she would join us later in the evening. 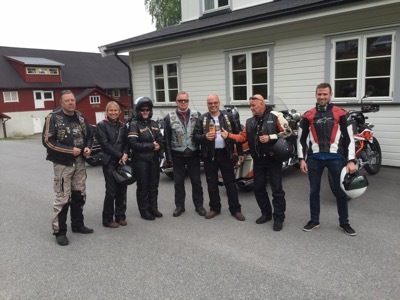 The Finns – Ilpo, Mia, Reijo, Antti, Timo and Jaana – arrived by ferry to Stockholm the very same morning and set in for a 700 km ride towards Nermo. Andreas and I tried to find all the smallest roads towards the hotel, just to extend the trip a wee bit in the warm and sunny weather. At Nermo, we found that we had the whole hotel to ourselves, so when the rest of the crew arrived in the late afternoon, we had our riders´meeting and dinner quite uninterrupted in the hotel´s library. The Finns even brought the necessary ingredients to make “salmiakki-kosso” as a gift: Koskenkorva vodka with bon-bons which you soak in the spirit to flavour it. Apparently a Finnish speciality which we will try out in due time. Oh, and they also brought Moomin cups from which to drink the stuff. Very posh. Friday morning was as sunny as the previous day, so when we set off for Venabygd mountain and Rondane, we couldn´t have asked for a more scenic friendly weather. The Finns and Dane, more accustomed to the flatness of their countries, seemed pretty satisfied with the scenery. Mia was even a bit sceptical when I told her that this was just a warm-up for the scenery ahead of us. But as it would prove later, it was. After Oppdal, heading towards Sunndalsøra, Kristiansund and the Atlantic Road, the Weather Gods decided to test our spirits. They opened all the showers and sprayed us thoroughly. 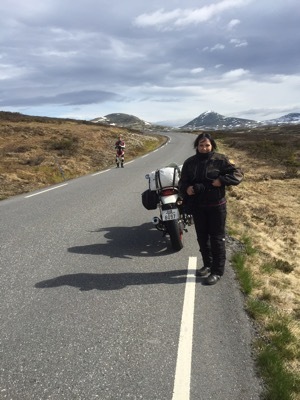 The Atlantic Road, which usually is quite an experience to ride across, was now cold, wet and something we hurried across to get to our chosen accomodation for the night, the Hustadvika gjestegård. My KTM´s speedo decided to call it the day at the last tank stop before the Atlantic Road, presumably getting tired of all the water. My wife´s Breva had a small oil leakage through a brittle valve cover oil seal, but none of these were serious faults and did not hamper our trip. At Hustadvika gjestegård, we dried ourselves, seeking refuge in a wee drop of Jaloviina, and had another wonderful dinner as we watched the skies clear up and hoping for less rain the next morning. When Saturday morning broke, it was still raining. 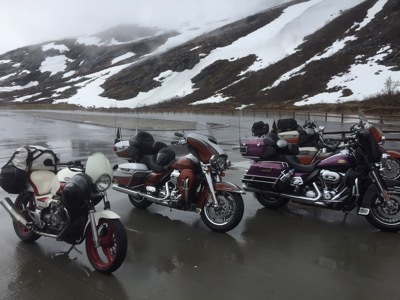 It eased off after breakfast, allowing me to fix the Breva´s wee oil leakage, so when we set off for Trollstigen, it was only raining a bit here and a bit there. The scenery as we neared Trollstigen was very dramatic, with the low hanging clouds and wet road. But the pay-off when we got to the top (and the souvenir shop where mandatory Trollstigen regalias were bought) was no less than awesome. The rain kept easing off, and we started to feel the heat from the sun as we set off towards Geiranger. When we settled for lunch at the Jordbærstedet cafe, the sun had returned, and the ride got even more joyful. 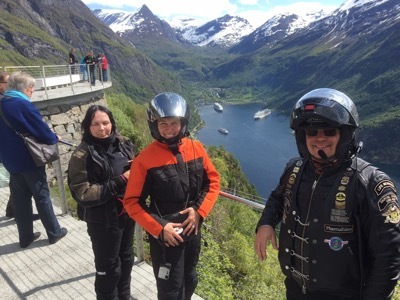 We could not have asked for better circumstances as we entered the Eagel´s Bend to look out on the Geiranger fjord. Mia now realised why the Venabygd and Rondane mountains were only warm-up. Reijo decided that the view was unreal and had to be created by special effects, smoke and mirrors. Andreas on his Honda was just a big grin inside his helmet, and Antti couldn´t get enough of video taping it all. Indeed a fantastic ride and a fantastic view. Even if we had to negotiate our bikes through a rather tourist crowded Geiranger to get to the mountain top on the other side, we were quite a happy band of riders when we met the intersection of the Stryn mountain road, which would eventually take us back to Lillehammer and our final stay-over for this trip. Reijo, a seasoned rider who as taken his bike to most parts of the world, including the Americas, Myanmar and Africa, concluded that parts of the road he had ridden today was all the way on the top of all he had ever enjoyed on a bike. 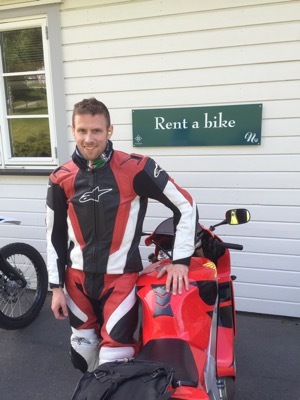 Quite a statement, and quite an endorsement of Norwegian motorcycle roads. The trip was a success to such an extent that we decided to repeat it next year, only then we´ll go to Finland. It will not be like this trip – but it will be different. And in the end, that is what it is all about. Andreas and yours truly on our way to Nermo Hotel. Andreas and his bike, although not for rent. 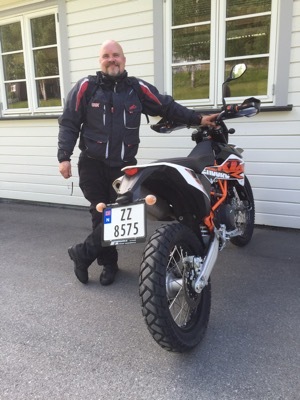 A KTM 690 Enduro works fine in Norway, I´d say. 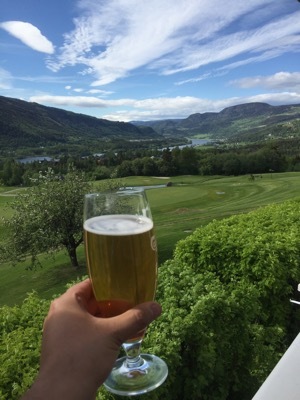 Cheers to the Gudbrands Valley! Ilpo (left), yours truly, and Andreas. We are working for the same company in our respective countries. My wife Sølvi´s Moto Guzzi Breva 750. 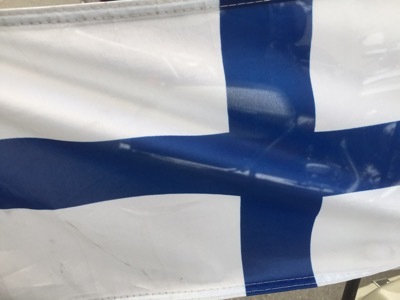 Well, the Finns have their regalias in order. Sølvi at Venabygd mountain, Andreas in the background. A wee stop on our way to Trollstigen. This is at Bolsøya. 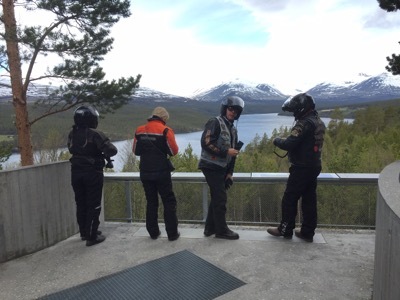 Parked at Trollstigen, watching over the bikes while the rest of the crew takes in the view. Sølvi (left), Mia and Ilpo at Geiranger. 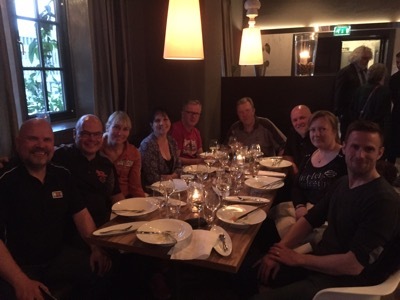 Final dinner at Hvelvet Restaurant in Lillehammer.